This breed is very prone to early tooth decay, much more so than many others. They are vulnerable to the effects of plague and tarter buildup. Infections easily set in. Let's discuss all the important aspects of proper dental care and the teeth of the Yorkshire Terrier. This will explain proper at home care as well as professional cleanings. Owners must be aware that this adorable Terrier breed is prone to dental issues. Dental care is vitally important. Yellowing on back side of teeth is 1 of the signs that there is too much buildup and a professional checkup is needed. By the age of 8 months old, the teething phase will be winding down and the adult set will be in. This breed is prone to issues...One is over crowding. While some will have a set of 42 permanents, others have 44 or 45 and these extra teeth can all of them to go out of alignment, off set the jaw and cause other issues. If you ever notice 2 rows (permanents come in before milk teeth have fallen out), bring this to the attention of the vet right away. With a good, normal set, the mouth will be in a scissor bite...Which means that the upper incisors are located just a bit to the front of the lowers. This causes a nice, smooth curve when closed. This can be thrown off if proper care is not given...which can lead to loose teeth and other problems. This will all help them be used to things that will happen during grooming...And being used to having the mouth and teeth touched will help them stay still when you are serious about scrubbing them. If you bring home an older Yorkie, one of the first things that you should do is to bring your dog to the vet. Not only for a medical checkup, but for a dental checkup. It does not matter if you received your Yorkie from the best breeder in the world or rescued your dog from a shelter...you will have no idea of the status of the dog's teeth and what type of dental care was previously given. Due to the high incident rate of health problems of the mouth, jaw and teeth, we highly recommend brushing each day. it only takes a few minutes, and with practice your dog will stay still and you will become an expert. At the very least, you should brush your Yorkie's teeth one time per week. A scraping, should you choose to do this, can be done as often as one time per month or every 6 months. Leaving a longer gap than 6 months, often brings you to a point where things may have spread under the gum line and will need to be taken care of by the vet. This should be done 1 time ever 2 years by an experience and trusted veterinarian. Some dog breeds receive professional cleanings every year. 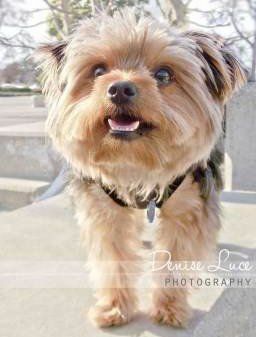 You would at first think that the Yorkie, being prone to dental disease, should have the same. However, the Yorkshire Terrier is very sensitive to anesthesia. Most professional cleaning are done by using anesthesia on the dog, so that the dog does not move while this careful cleaning is being performed. You will be removing plaque and the veterinarian will be removing tartar via scraping...You may choose to do that yourself at home, but many owners find it best to allow the vet to take over this element...As it is tedious and very important that no spots be missed. The tartar is a yellow color. When you notice any buildup of this, it will a sign that your Yorkshire Terrier needs to go to the vet for a professional cleaning. Every other year for most is fine, as long as you keep up with cleaning at home. For those with previous issues and/or soft teeth, twice a year may be needed and the pros and cons of anesthesia will need to be weighed and discussed with the vet. Never use human toothpaste. A dog can swallow a lot of paste during the cleanings and the fluoride which is found in human tooth paste can wreak havoc in a dog's system. Some of them can be toxic, others may cause digestive issues or at the very least an upset stomach to varying degrees. The actual fluoride levels and polishing elements are not made with canines in mind and will not work as well on them as with you. A dog finger tooth brush should be used if a Yorkie is just starting off and not used to things yet. The goal will be to work your way up to a quality 3-sided toothbrush that is sized for toy breed dogs. The right brush will have the correct textured bristles to remove build-up and also be sized correctly, since a Yorkie has a small mouth and does not have the ability to open the jaw very wide. Begin at the earliest age possible. If your puppy is really putting up a fuss, you may wish to begin by just allowing him to become used to having your finger in his mouth without any paste. For the first week, set aside 10 minutes per day to have your dog sit down with you. Rub your finger all along your dog's teeth. Be sure to touch all of the teeth. When your Yorkie sits still and behaves, reward him with happy praise, hugs and a small treat. Learning to have the mouth manipulated is all part of touch desensitization and most dogs learn quickly. You may find that a young puppy is very hyper and will not want to sit still. However, if you remain constant and do this each day, he or she will learn that when you say "Tooth Time" or whatever command you do use, that it is time to sit close to you and have their teeth touched. After a week or so, begin using the dog finger tooth brush and then graduate to the 3-sided brush. You will put a dab of quality canine toothpaste on this. Be sure to brush all of the teeth. 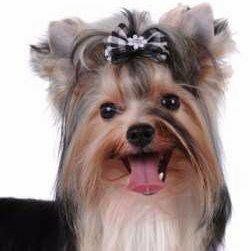 You should brush your Yorkshire Terrier's teeth for approximately 3 minutes; this will ensure that all spots have been thoroughly scrubbed. It is split about 50/50 among owners if this is done at home or by the veterinarian. There are pro's and con's to both. If your dog is very patient and sits nicely for you...allowing you plenty of time to reach all areas and not feel rushed, it may be best to do this yourself. However, if your Yorkie just won't stay still for this and is very resistant to having the tool in his or her mouth, it may then be best to leave this for the specialist. Most owners try this at least 1 time, to see how they feel about it...and how their dog reacts...Then a decision can be made. An owner should not feel intimidated. This is very similar to when humans use a plaque scraper. Some actually opt to use a human plaque scraper, which can be purchased at any store in the dental care section. However, there are scrapers made specifically for toy sized dogs. 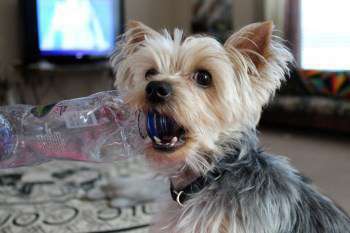 This is recommended, since the Yorkie is very small and a scraper for toy breeds will fit easily into their mouth without feeling too overwhelming. The dog should sit down (and should already be used to having their teeth touched from the daily or weekly tooth brushings). As you carefully scrape each tooth, use clean gauze pads to wipe the plaque from the scraper. You may find that you need to wipe it off several times for each tooth, both front and back. Small pieces of gauze work well, as you can easily toss them aside and use fresh ones as needed. Since your dog will be trying very hard to behave and sit nicely while you do this, if they make it trough without worming around the entire time, do reward them afterward with lots of happy praise and a yummy treat. Once the teeth are scraped, you should follow up with a brushing. And then of course, with another yummy dog treat to reward your Yorkie for being so good. Long ago, it was thought that feeding a dog dry dog food or hard dog treats was sufficient for cleaning the dog's teeth. We now know that this is not true. No matter which type of food you offer, whether wet or dry, brushing and cleaning is a vital part of caring for a Yorkie. Offer treats that are created to help maintain good dental hygiene (Greenies teenies are the #1 choice) at least 1 time per day. These help remove some plaque and keep jaws strong. Never think that "a dog's teeth will take care of themselves". It is a myth that a dog will clean its teeth by chewing on things; this only cleans teeth a bit...not enough! To keep your dog healthy, one must understand all dental issues. We cover the details of this and many more health and care elements in the YorkieInfoCenter Book. Now in both Print and eBook format.